$459$4 and 59 cents$3.99 / oz. $1899$18 and 99 cents$15.83 / oz. Shop Cuba Jungle Zebra Eau de Parfum Spray (1.17 oz. )1.17 oz. $1899$18 and 99 cents$16.23 / oz. With packaging and bottles designed to look like Cuban cigars, Cuba perfumes for men and women can be a great gift for friends or family members who appreciate a fine cigar. You can also try them just for their signature scent that contains notes of lavender and jasmine. 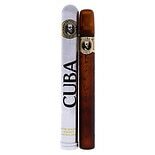 Choose between different types of sprays and varieties of Cuba perfumes here at Walgreens.com. Most Cuba perfumes for men come in eau de toilette sprays. These sprays contain a less highly concentrated fragrance than eau de parfum, so you can use them liberally or use a little for a light scent. Varieties of Cuba fragrance for men include Cuba Gold, Cuba Miami and Cuba Magnum among others. Women can choose Cuba Jungle Zebra, which comes in eau de parfum spray. In addition to Cuba perfumes, you can find a range of popular fragrances among our selection. We carry men's colognes and women's perfumes from brands such as Calvin Klein and Dolce and Gabbana. You can also choose perfumes and colognes endorsed by popular celebrities including Sarah Jessica Parker, Halle Berry and Antonio Banderas.